At its core, the gross profit margin measures a company's manufacturing or production process efficiency. It tells managers, investors, and other stakeholders the percentage of sales revenue remaining after subtracting the company’s cost of goods sold. Any money left over goes to pay selling, general, and administrative expenses such as salaries, research and development, and marketing, which appear further down the income statement. All else equal, the higher the gross profit margin, the better. The gross margin serves as an especially important assessment metric within industries and sectors because it allows for a better apples-to-apples comparison among competitors. A company capable of boasting sustained gross profit margins that are materially higher than its peers almost always has more efficient processes, more effective operations overall, making for a safer long-term investment provided its valuation multiple isn't too high. You can find the appropriate gross margin range for public companies within a given industry by reading industry reports from equity research analysts, rating agencies, statistical services, and other financial data providers, which you might be able to get from discount brokerage firms at no charge. For example, Charles Schwab & Company, one of the largest brokers in the United States, has a deal with the Swiss bank, Credit Suisse. The firm's customers can download and read industry-specific financial reports which include gross profit margin calculations. Likewise, the firm also has data on specific companies from the data firm Thomson Reuters, which includes comparing a given company's gross profit margin with its direct and closest competitors in conveniently formatted charts. 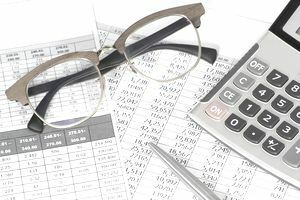 Using a company’s income statement, find the gross profit total by starting with total sales, and subtracting the line item Cost of Goods Sold. This gives you the company’s profit after covering all production costs, but before paying any administrative, overhead or other costs that don’t directly factor into producing the company’s widgets. Say you want to calculate the gross profit margin of a fictional company called Greenwich Golf Supply. You can find its income statement at the bottom of this page in Table GGS-1. For this exercise, assume the average golf supply company has a gross margin of 30 percent. The answer, .40 (or 40 percent), reveals that Greenwich is much more efficient in the production and distribution of its product than most of its competitors. The next question you, as a potential investor, analyst, or competitor want to discover is, "Why?". What makes Greenwich so much more profitable? Does it have a source of low-cost inputs? If so, is it sustainable? For example, you can see this with airlines from time to time as certain airlines hedge the price of fuel before it skyrockets, allowing these firms to generate much higher earnings per flight than competitors. The benefit, however, has limits because those hedging contracts expire, making it more of a one-time, temporary but lucrative boost in profitability. The typical jewelry store generates gross profit margins of between 42 percent and 47 percent. Look at Tiffany & Co.’s 2014 income statement, for example. How does Tiffany & Co. compare? For the period in question, Tiffany had a gross profit of $2,537,175,000 with sales of $4,249,913,000. Putting this in the gross profit margin formula, you’ll discover that Tiffany has a very high margin of 59.7 percent ($2,537,175,000 / $4,249,913,000 = 0.597, or 59.75 percent). According to this analysis, Tiffany appears far more efficient than its competitors, with the ability to convert more of each dollar in sales into a dollar of gross profit that it can use to build the brand, expand, and compete against other firms. When you dig deeper into the company’s annual financials in its 10-K filing, you find that this is due in part to its ability to generate much higher sales per square foot than other jewelry stores ($3,100 per square foot versus $1,035 per square foot for competitor Signet Jewelers, which operates Kay Jewelers, Zales, and Jared jewelry stores). Its size and scope also allow it to gain economies of scale in the manufacturing and distribution of its jewelry products. Tiffany also commands premium prices for its products, even if it did pay similar manufacturing costs than other jewelry manufacturers, and this could play a small part as well. Generally speaking, companies tend to maintain stable gross margins over time. Significant fluctuations can be a potential sign of fraud, accounting irregularities, mismanagement, declines in the business itself, large increases in the cost of raw product inputs, or, if positive, a turnaround, expansion, or product mix shift that has rewarded owners such as the one the Apple experienced after the return of Steve Jobs several decades ago. If you are analyzing the income statement of a business and find its gross margin has historically averaged around 3 percent to 4 percent, and find that it suddenly shoots upwards of 25 percent, it should warrant serious investigation. Perhaps it has an entirely legitimate reason, but you want to know exactly where, how, and why that money is being generated. The company has continued to maintain a strong margin with little fluctuation from year to year.